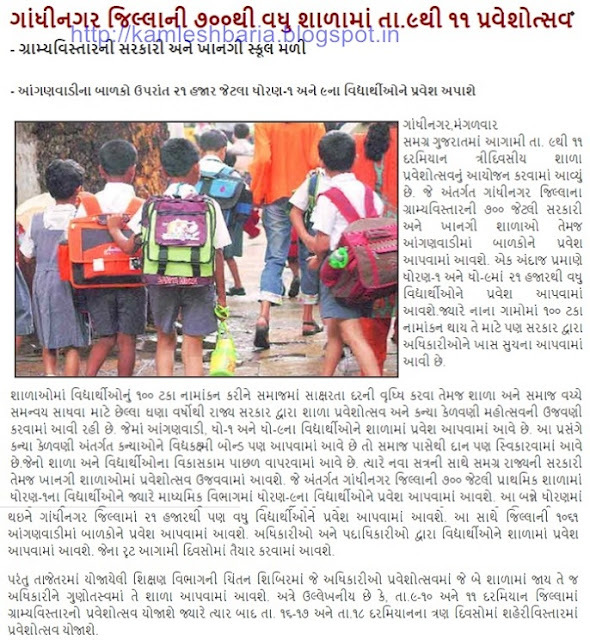 Pravetosav Updates:-Gandhinagar Jille Me 9 To 11 Date Tk 700 Up School Me Pravetosav..! Pravetosav Updates 2016:-Gandhinagar Jille Me 9 To 11 Date me 700 Up School Me Pravetosav..! Pravetosav 2016 Ki Sururaat June Month me honevali he iske chalte Gandhinagar Jille Me 9 To 11 Date me 700 Up School Me Pravetosav.Hoga. ~>Jyada Jankari Ke Liye Niche Di Gyi Image Pdhe. Previous articlePRE. PTC Updates 2016:-Admission Notification for D.EL.ED Pre PTC (Bal Adhyapan Mandir) 2016. Next articleLatest Updates:-Vadodra Viklp Camp Court Matter Ki Vjh Se Mokuf.